I love teaching with a theme that gets my kids excited! 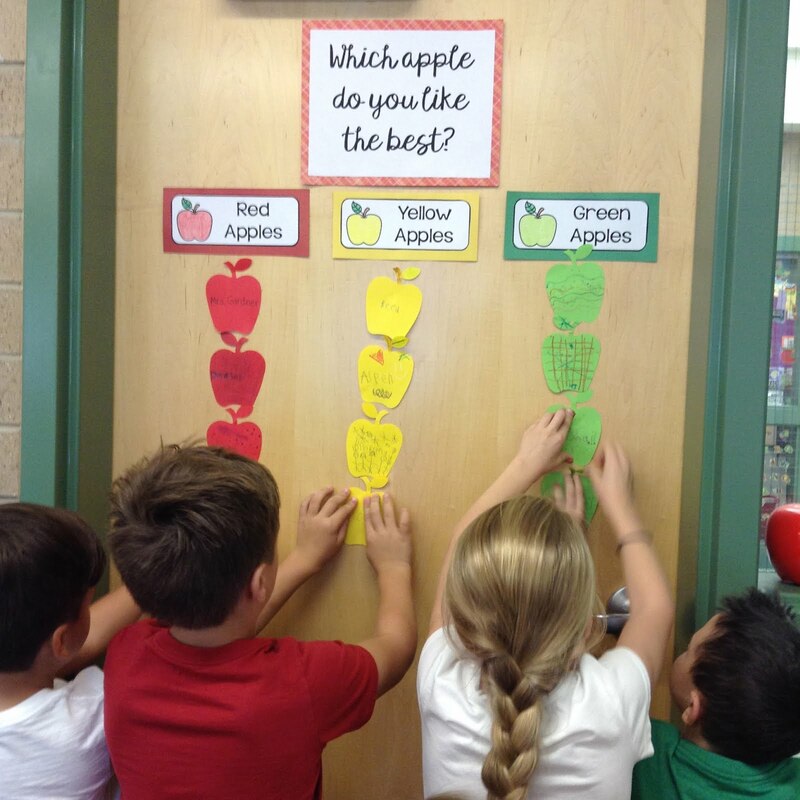 During our big "Apple Week" student engagement is at an all-time high and that is a powerful ingredient for student learning. 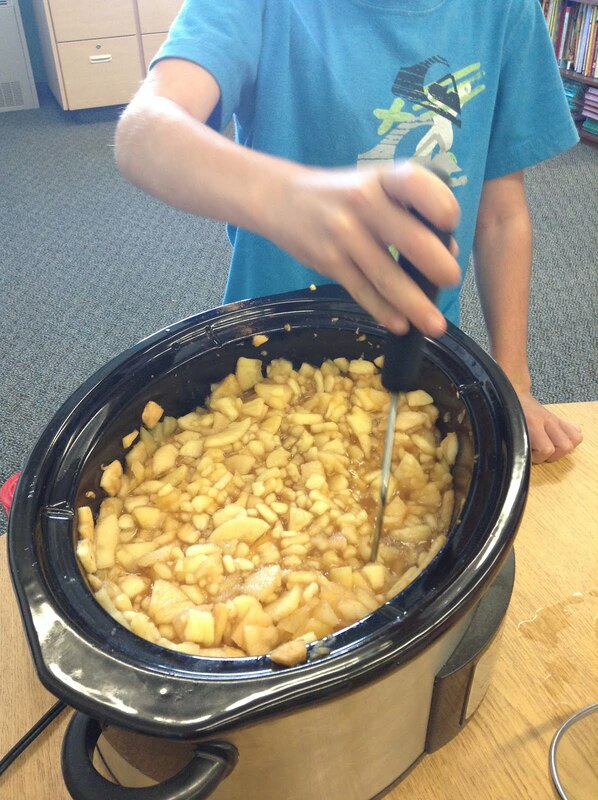 Here are five tried-and-true apple activities that have been favorites in my classroom. Gather as many as you can and make sure they are available to students throughout the week for whole class, small group, buddy, and individual reading. Try to have a mix of fiction and non-fiction for variety. Have your chart posted somewhere in a central place so students can easily refer to it. Begin by having students write what they know about apples, and then what they might be wondering. I like to use large square sticky notes for this and stick them right to my whiteboard. As students learn more throughout the week they can add to the chart. I also have my students keep their own personal copy (free one available here) in their desks. Students love this! There are a million different varieties of apples out there so I like to stick with trying three different colors of apples. I usually pick up Granny Smith for green, Red Delicious for Red, and Golden Delicious for yellow. 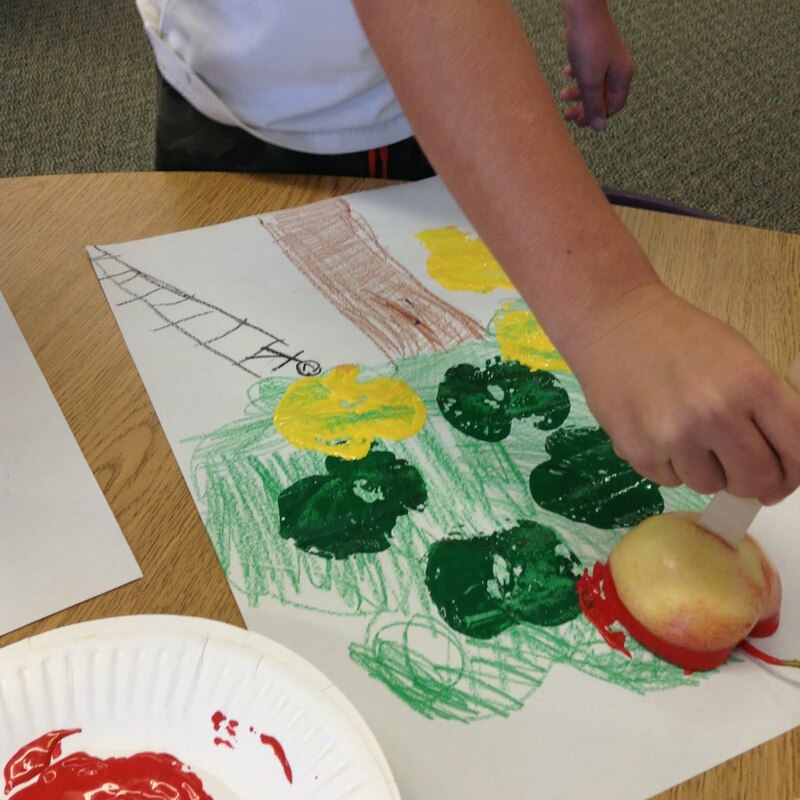 After students try the apples and pick the one they like best I have them come pick up a paper apple of the color they chose. I have them stick it up in a bar graph layout and then we use this (free!) 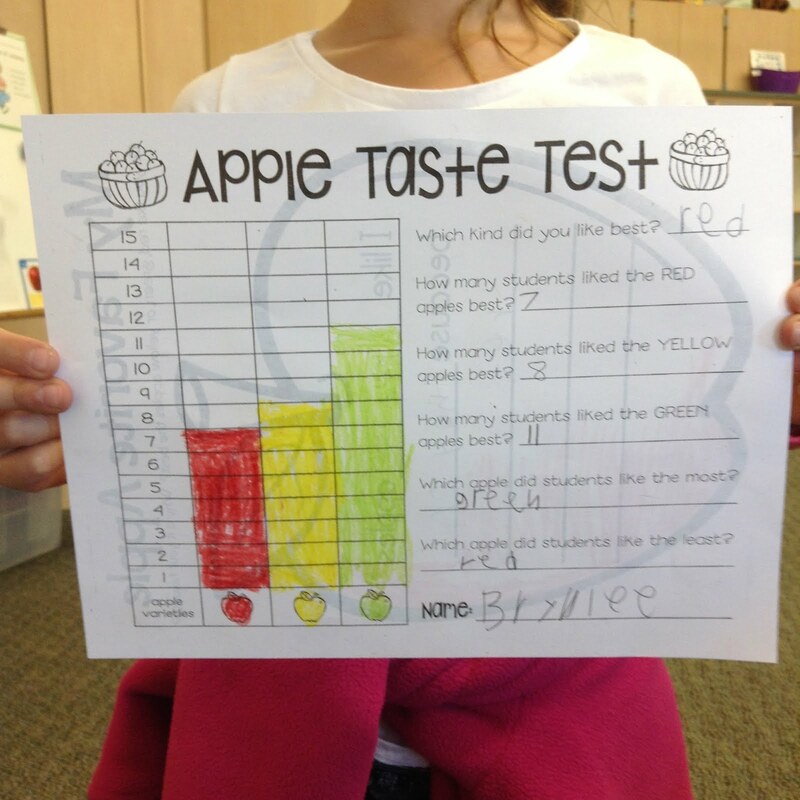 taste test paper to graph and discuss the results. 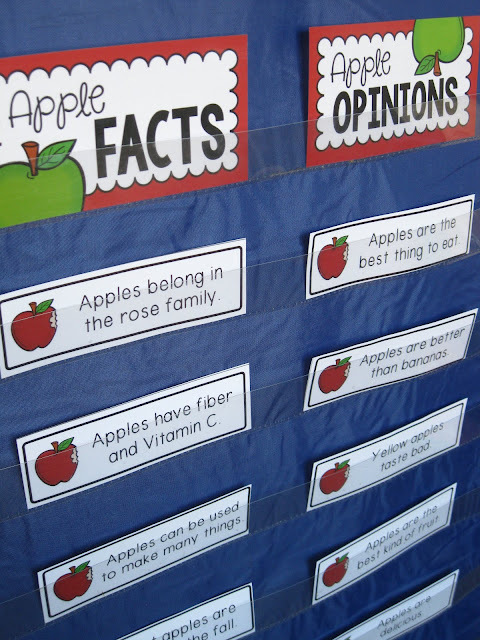 Read a non-fiction book apples (or two or three) to your students. They will be fascinated to learn new interesting facts about such an everyday object. You can also sort out apple facts from opinions with this pocket chart activity available here. I have my students do a variety of centers while I am meeting with guided reading groups. During our themed weeks I like to put out some options that fit with the theme. 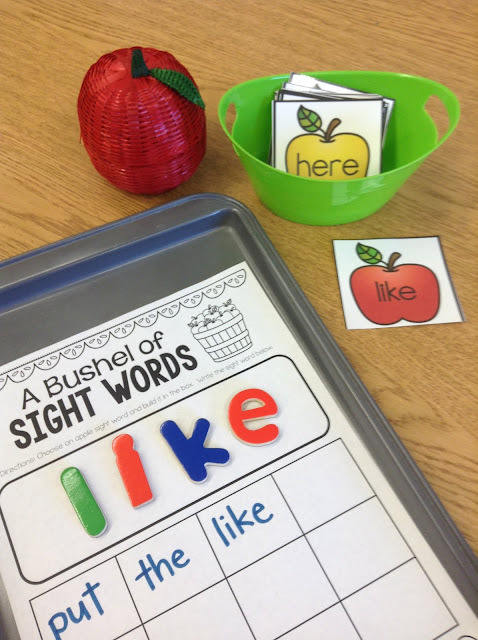 Some ideas (available here) include three digit addition or sight word building. This is a fun one! Slice apples in half and insert a thick popsicle stick. 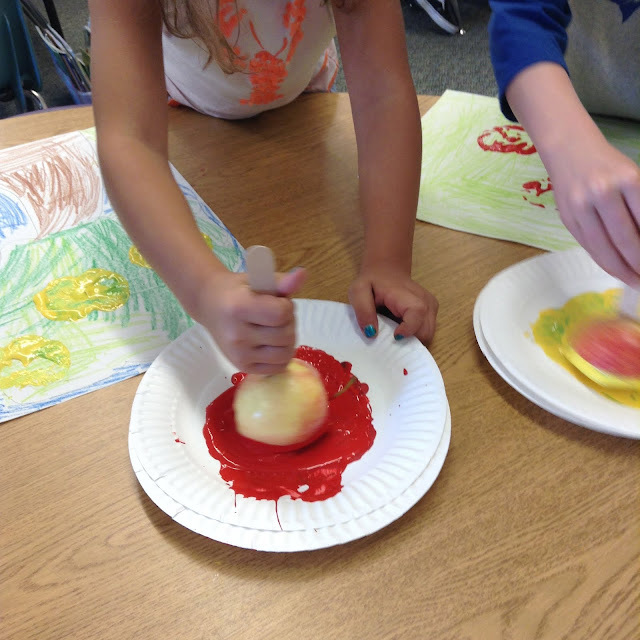 Put out paper plates of red, green, and yellow paint. 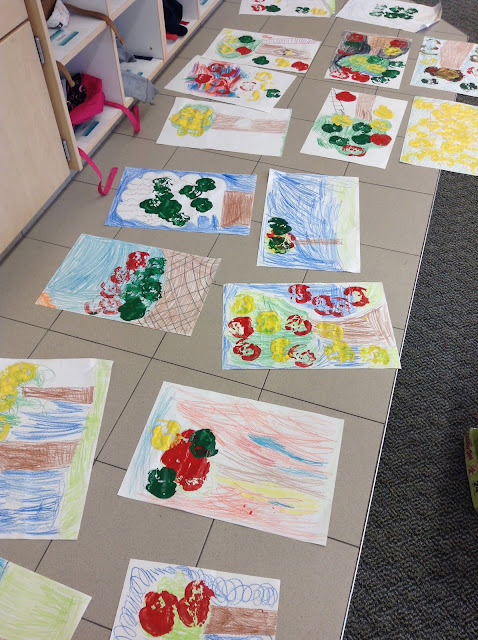 I gave my students a large sheet of paper and had them draw a background image before doing the stamps. These turned out so fun! This is one of the first Pinterest freebies I ever discovered, haha! I have my kids do it every year because it is great practice and they really enjoy it. Click here for this freebie from Reagan Tunstall. 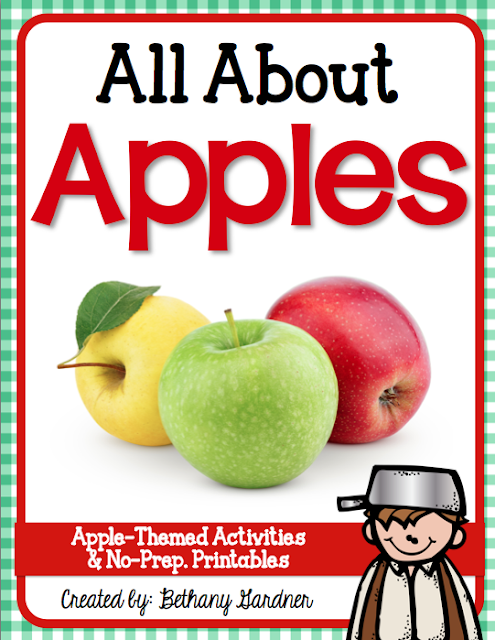 Use this awesome and easy freebie to conduct some simple apple science experiments and get your kiddos thinking and hypothesizing. This is by far one of the most memorable days of first grade for my students...and it actually doesn't take as much effort as you'd think. I plan to do a whole post on this and I will link it here when it is ready. 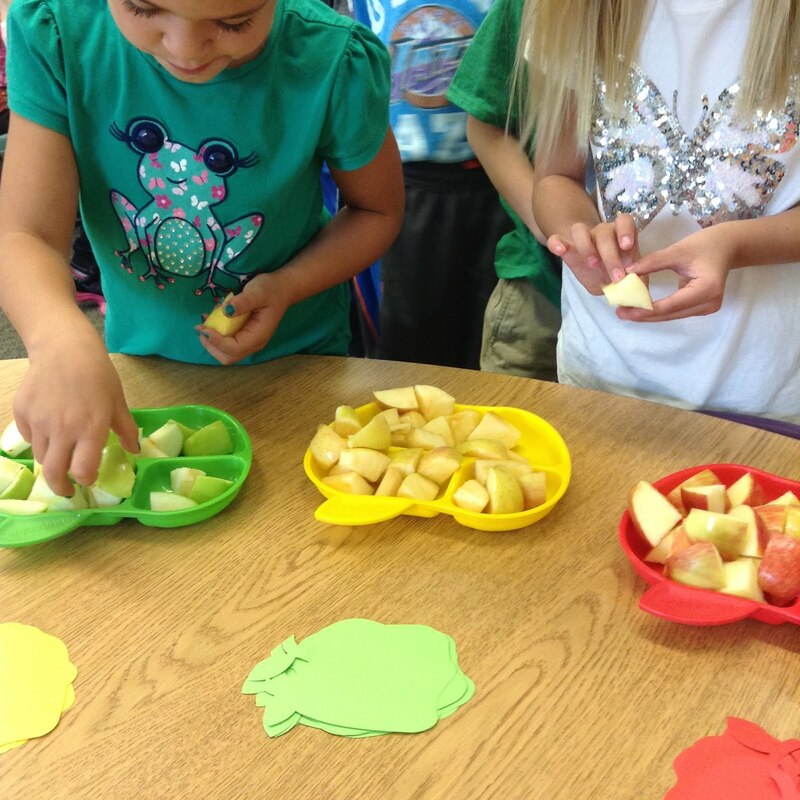 I hope you enjoy doing apple activities with your students! If you are looking for an apple resource with lots of great activities, click here!